Back in 2011, we were wondering how to develop the first hypothesis in the large and very complex assignments we were undertaking. We decided to look at other trades and industries to see how they approached complex tasks. After some investigation, we heard that the CIA was using something called “grounded theory”; later this turned out to be a vital element in capturing Osama bin Laden. We decided to learn more about grounded theory. After a while, we found out that it was also used in research relating to DNA. 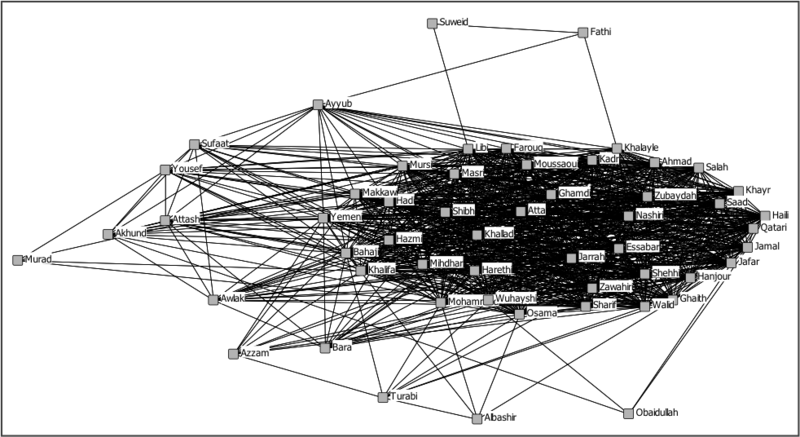 A number of scientists had developed a piece of open software, Cytoscape. This caught our attention, and we started to experiment with this software and grounded theory, in order to analyze the huge amount of data that we were collecting as part of a highly complex assignment. Using these tools, we were able to draw out from the massive amount of data some really good hypotheses. After a while, we also realized that grounded theory is a perfect methodology for codifying both quantitative and qualitative information—and identifying relationships, and clusters of relationships. This was how the CIA used grounded theory and a large volume of data to figure out where Osama bin Laden was hiding (see graph below). Last year the CIA released to the public nearly 470,000 additional files recovered in the May 2011 raid on Usama Bin Ladin’s compound in Abbottabad, Pakistan. CIA Director Mike Pompeo authorized the release in the interest of transparency and to enhance public understanding of al-Qa‘ida and its former leader. The files released are published at https://www.cia.gov/library/abbottabad-compound/and also source of further investigations. We learned that it was possible to take this technique one step further—not using just source, target, and relationship (which is the cornerstone of grounded theory and underpinned the capture of Osama bin Laden), but rather taking perspectives clustering on several levels. The enhanced technique is now widely used by cutting-edge organizations—e.g., Netflix, featured in today´s issue of the The Economist. When we founded Innovation 360 Groupin 2014, we drew not only on the last hundred years of current thinking in innovation management, but also on the lessons learned from handling very complex analytical assignments in the past. One of the cornerstones of Innovation 360, from the start, has been handling, codifying, comparing, and contrasting large amounts of complex quantitative and qualitative data to generate hypotheses and form theories that could be used on a deeper level to enhance understanding and to make recommendations that are tangible, measurable, trackable, and actionable. Last week, we proudly launched our clustering techniques for ideation, based on cognitive artificial intelligence (AI), in the form of the platform ideation360. This is the fruit of more than ten years’ hard work and insights gained from a countless number of assignments, the best-available technology, and in-depth learning. We had already discovered that using cognitive artificial intelligence opens the door to finding new patterns in complex organizations. We also discovered that it is possible to collect ideas in multinational organizations in any language, translating these in real time, analyzing the sentiments and the keywords, clustering these, and providing new and important insights regardless of geographic borders or linguistic barriers. We are now rolling out ideation360.comacross the globe. Only time will tell what new insights will be gained, and what new ideas will see the light of day. In parallel, we also worked to launch Sherlock, the world’s first and leading AI-based analytic platform—for innovation goal-setting, management, and analysis. Like ideation360,Sherlock is built upon the principles of clustering; it aims to grasp insights based on current thinking, data from all over the world, and insights from our community of innovation consultants (who constantly feed into the platform new insights from every corner of the world). In the coming year, we plan to continue launching innovation-management solutions: from analytics to innovation management; from ideation to commercial success; from project to portfolio; from strategy to execution; and from simplified KPIs to innovation metrics covering strategy, tactics, and operational measures. The best part of all is that you are invited to co-create with us. Please join us at guidetobusinessinnovation.com today, and help shape tomorrow’s world.